Home » Fowler's Toad "Warts"
Many amphibians have poison glands in their skin. 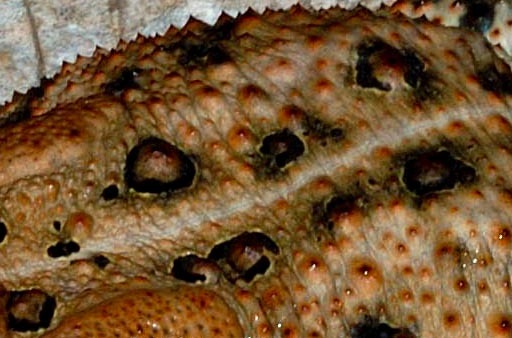 This image shows one of the prominent poison glands (left) of the Fowler's toad, located just behind each eye, as well as the numerous "warts" on the toad's skin. The poisons secreted by these animals help to ward off predators. Detail, photo by Suzanne L. Collins, Center for North American Herpetology.